Political science and legal studies Prof. Jacqueline Stevens discusses how private prisons profit from immigrant detainees’ labor at an event held by Unshackle NU on Tuesday night. 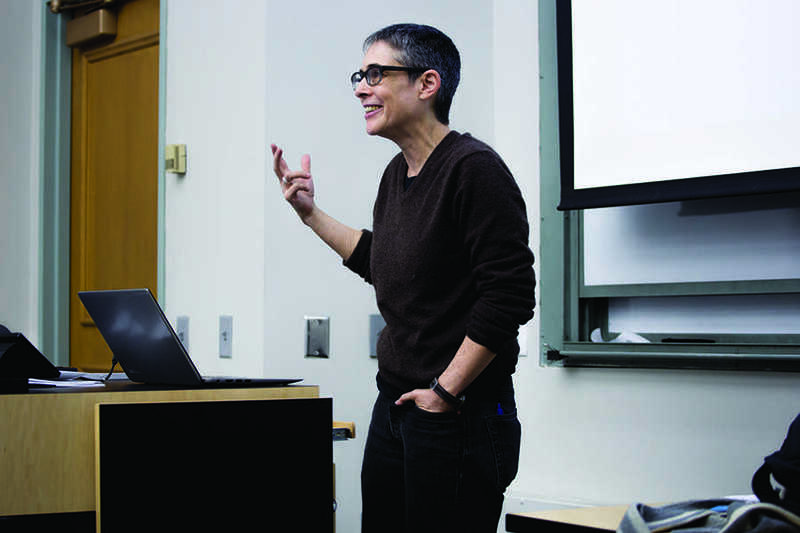 Stevens was the second speaker in the group’s quarter-long series, which began last month with activist Mariame Kaba. Political science and legal studies Prof. Jacqueline Stevens highlighted the way private prisons profit from the labor of immigrant detainees at Unshackle NU’s event Tuesday evening. About 45 students heard Stevens, the director of the Deportation Research Clinic at the Buffett Institute for Global Studies, speak at University Hall. She began by discussing the “dollar a day” conditions in which detainees in immigration jails, or detention centers for people suspected of illegal entry, are forced to perform janitorial, kitchen or other duties for only $1 per day. “I call them slaving wages,” she said. She explained that the 13th Amendment, which abolished slavery, does not label work done as part of punishment as illegal. But because people in immigration jails have not committed crimes and are only being held because they are a “flight risk,” they are actually covered by the 13th Amendment, Stevens said. She also discussed how private prisons will add an extra $1 or $2 to inmates’ pay if they seem unwilling to work for just $1. “It really shows the illegality of it,” Stevens said. Facilities as close as the McHenry County Jail in Woodstock, Illinois, about an hour and a half northwest of Evanston, use “dollar a day” labor, she said. Stevens said she became interested in learning more about NU’s possible involvement with private prisons due to other activities by the University she found disreputable, such as its role in the case of former philosophy Prof. Peter Ludlow, who resigned last quarter after more than a year of legal battles and University findings that he sexually harassed two students. However, the Illinois Freedom of Information Act exempts nonprofits and private institutions like NU from having to disclose information, Stevens said. She called on students to lobby for a change in the act. Weinberg junior Amanda Ortiz said she was interested in attending the talk after having Stevens as a professor and learning about detention centers. Alejandro Banuelos, a Weinberg junior and organizer with Unshackle NU, said the group wants to show that NU is invested in private prisons in addition to shedding light on the prison-industrial complex. He added he hopes Unshackle NU’s events inspire people to participate in more long-lasting organizing and mobilize around these issues, rather than simply absorbing the information they learn.